Are you looking for a stylish and comfortable chair that is capable of rising and reclining you from your position? 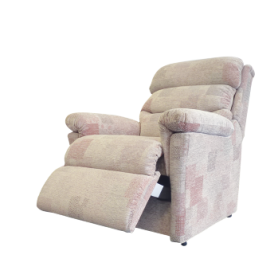 At Eden Mobility, we have a carefully selected range of both single and dual motor recliner chairs that will enable you to obtain the perfect seated position. "A luxury chair handmade in Britain"
"Relax in multiple positions, at the touch of a button"
"The dual motor chair with infinite seating positions"
"Our best-selling, luxurious triple-action chair"
"Exclusively created for Eden Mobility with our customers in mind"
"The classic rise & recline chair that ensures all your comfort needs are met." A rise and recline chair features the comfortability of an ordinary armchair but has built-in motors. These motors can be operated using a controller to raise the base of the chair up and down. Some of these recliner chairs have additional motors that even allow the foot and backrests to be operated independently; enabling the user to obtain the perfect position. How can a recliner chair help me? If you are having difficulties getting in and out of your chair, a mobility recliner chair from Eden Mobility could help you. A rise and recline chair will enable you to let the chair do all of the hard work. We are able to provide a range of recliner chairs so that you can sit and relax with maximum comfort in your living room. All of our rise and recliner chairs are made using only the highest quality materials and fabrics. We have styles and colours available to suit any living room décor. Our electric riser recliner chairs have single, dual or triple-action motors, which can be operated using a handheld controller.